Really, this guy is almost worse than Chauvelin. 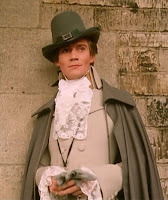 He, at any rate, acknowledges that Sir Percy is brave and compassionate and maybe even has a teeny little bit of respect for him, at least, as a worthy foeman. What a traitor! And part of the League too! (Although one who does wants to get out of it.) I believe I hate you more every moment, Devinne. There was nothing he desired more at the moment than to extricate himself from the entanglement of the League, but he was wise enough to realise that if this was done at this juncture, he would, on his return to England, find the doors of more than one smart hostess closed against him. And you don’t even have the tiniest bit of a reason. No, wait, there can’t be a reason for such treachery. I’ll say excuse. What is your excuse? Or explanation? You’ll want a cast-iron one, you know, to make me understand it. Oh, what was that? You said you were in love? Even if you were, you purposefully put her in danger by trying to stop Blakeney’s plan to save her. And as to your real feelings, bah! I have it from your authoress, Baroness Orczy herself, what your love really was. You are so full of vanity that you can’t recognize a man a million times better than you even when he stares you in the face! What was that you said about your chief? Show Blakeney who is the better man! Excuse me while I laugh, this is really too preposterous. The very idea! Perhaps I’m not saying you are a detestable, vain, traitorous, cowardly, cheating, villainous wretch, my Lord St. John Devinne, but one of you is a detestable, vain, traitorous, cowardly, cheating, villainous wretch and it’s certainly not him. There. Happy Valentine's Day! Hope your day is absolutely lovely! 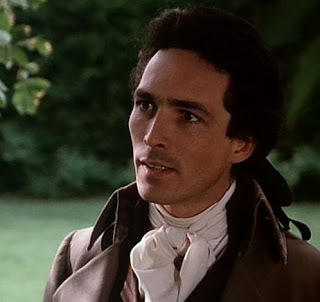 I just thought I'd share some of my favorite romantic scenes from the 1982 film and passages from some of the TSP books for that bit of Percy/Marguerite fix for Valentine's Day! They are - naturally - my favorite literary couple, and what better time to celebrate that than today? "I shall love her till the day I die. That is the tragedy." She had stolen out at dawn to wait for him on the pier; and sure enough, as soon as the May-day sun, which had risen to-day in his glory as if to crown her brief happiness with warmth and radience, had dissipated the morning mist, her yearning eyes had spied the smart white gig which had put off from the Day-Dream leaving the graceful ship to await the turn of the tide before putting into port. Since then, every moment of the day had been one of rapture. The first sight of her husband in his huge caped coat, which seemed to add further inches to his great height, his call of triumph when he saw her, his arms outstretched, there, far away in the small boat, with a gesture of such infinite longing that for a second or two tears obscured Marguerite's vision. Then the drawing up of the boat against the landing-stage; Percy's spring ashore; his voice, his look; the strength of his arms; the ardour of his embrace. Rapture, in truth, to which the thought of its brief duration alone lent a touch of bitterness. Thus he saw her as he re-entered the room, and for one second he paused at the door, for the joy of seeing her there seemed greater than he could bear. Marguerite had paused on the threshold. After the glaring light of the guard-room the cell seemed dark, and at first she could hardly see. The whole length of the long, narrow cubicle lay to her left, with a slight recess at its further end, so that from the threshold of the doorway she could not see into the distant corner. Swift as a lightning flash the remembrance came back to her of proud Marie Antoinette narrowing her life to that dark corner where the insolent eyes of the rabble soldiery could not spy her every movement. Marguerite stepped further into the room. Gradually by the dim light of an oil lamp placed upon a table in the recess she began to distinguish various objects: one or two chairs, another table, and a small but very comfortable-looking camp bedstead. Just for a few seconds she only saw these inanimate things, then she became conscious of Percy's presence. He sat on a chair, with his left arm half-stretched out upon the table, his bead hidden in the bend of the elbow. Marguerite did not utter a cry; she did not even tremble. Just for one brief instant she closed her eyes, so as to gather up all her courage before she dared to look again. Then with a steady and noiseless step she came quite close to him. She knelt on the flagstones at his feet and raised reverently to her lips the hand that hung nerveless and limp by his side. "I tell you that I do not know, and if I did--"
She put her arms round him and pillowed her head upon his breast. He turned his head slowly toward her, and now his eyes--hollowed and rimmed with purple--looked straight into hers. Or is he in hell? "Sink me...the lady's a poet!" A review of this movie on this blog seems almost as ridiculous as putting up a poll asking if Sir Percy is heroic. 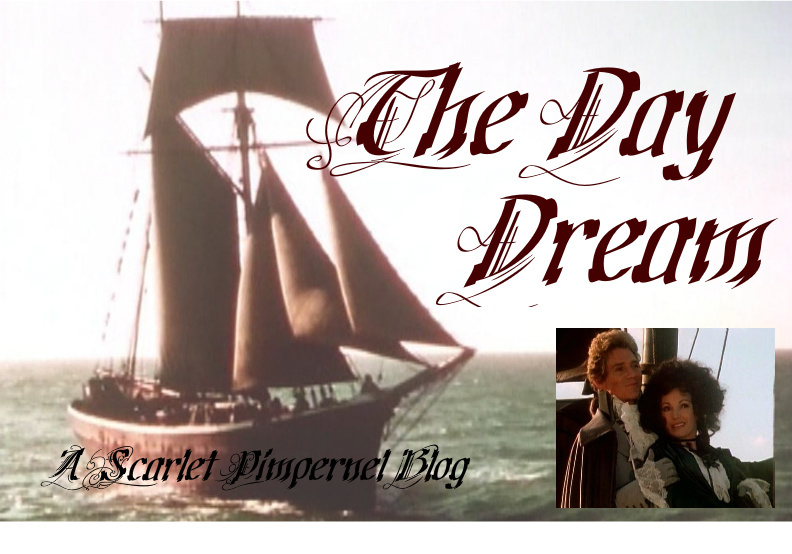 But since, when I first watched it, some of my followers (thank you, dears) were kind enough to ask for a review and since this is a blog where we get to talk as much as we like about the Scarlet Pimpernel, I thought I would post it. See, I can always find good excuses for something I want to do. One thing I really liked about this movie is that it shows Percy and Marguerite before they're married. We get to see Marguerite as an actress and what Percy is doing in France. The plot superbly blends The Scarlet Pimpernel and El Dorado and has the best of both. Casting: The first thing we talk about is obviously our dear hero himself, or as my little sister calls him, 'Sir Percy Sink-me'. 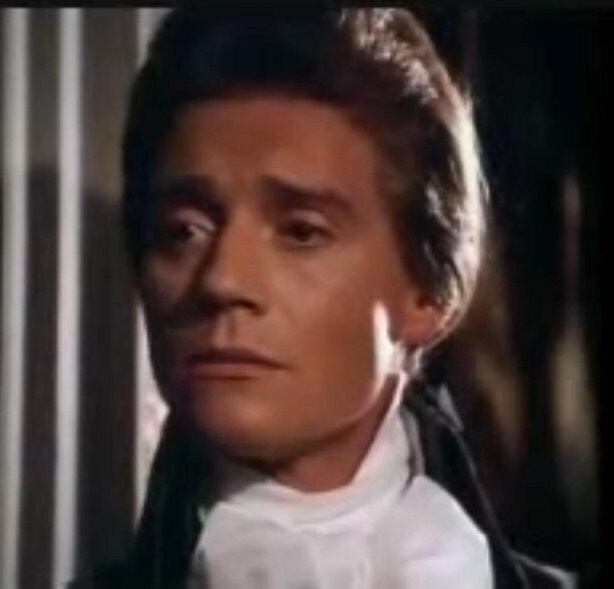 Anthony Andrews is absolutely a.m.a.z.i.n.g. in the role. He delivers Percy's witty banter perfectly and teases Chauvelin crazy. Oh wait, Chauvelin is crazy already. More crazy, then. 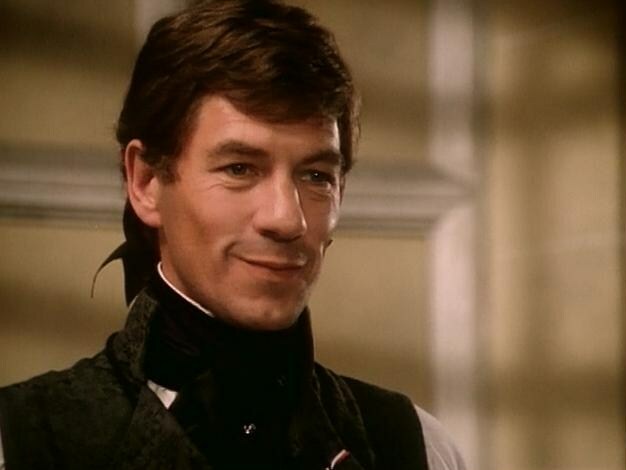 :P Words aren't enough to describe the chemistry between him and Marguerite. Just beautiful... He balances the fop and the hero perfectly, and you end up falling in love with both. On top of that, his looks are exactly what they should be (talk about understatement! ), and he is SPOILER ALERT an amazing, amazing, amazing fencer. The greatest thing I have against the musical is that he lost the duel. That just would never happen and it's delighfully evident in this movie. END OF SPOILER. And, as Abby pointed out, the first names of the two members of the league we hear about are Anthony and Andrew. 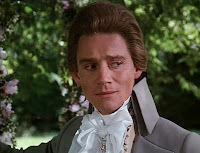 It's like Anthony Andrews has an absolute right to the role. (Well, he does. :)) And that thing with Percy's eyes (especially mentioned in the short stories) happens with Anthony Andrews too. The fact that his eyes are brown instead of blue is beside the point. I like brown eyes. Jane Seymour is drop-dead gorgeous as Marguerite. She captures Marguerite better than I thought anyone ever could and the chemistry between her and Percy is just beautiful. Oh wait, did I say that already? Well, it bears repeating. After Sir Percy and Marguerite we come of course to The Wily Little Fox, also known as Chauvelin. 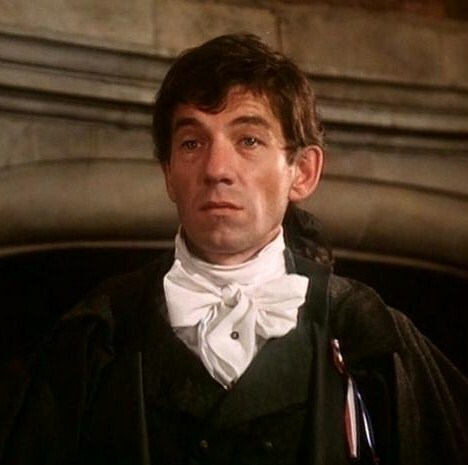 Ian McKellan is everything that he should be and more besides. 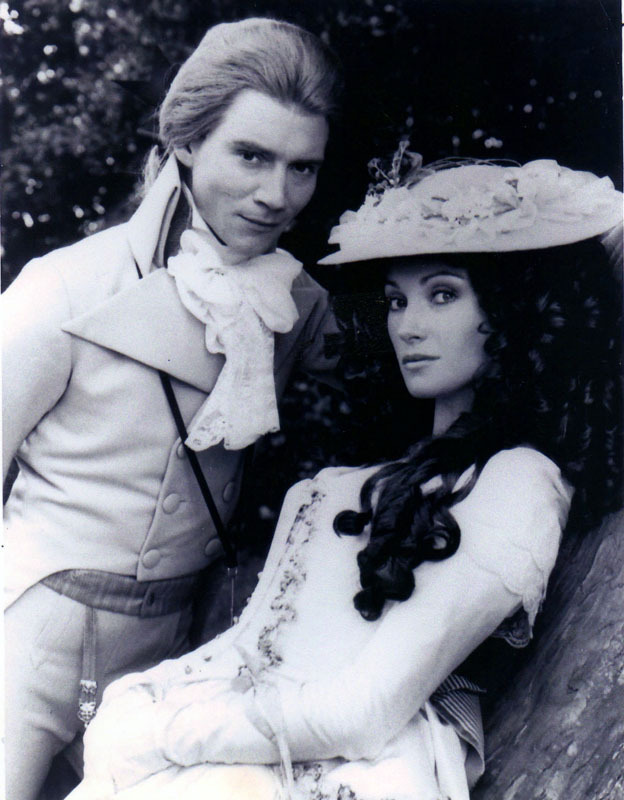 It was a stroke of genius to have him be in love with Marguerite too. Something like it was mentioned in El Dorado with Marguerite's cousin, and they've taken it one step further. 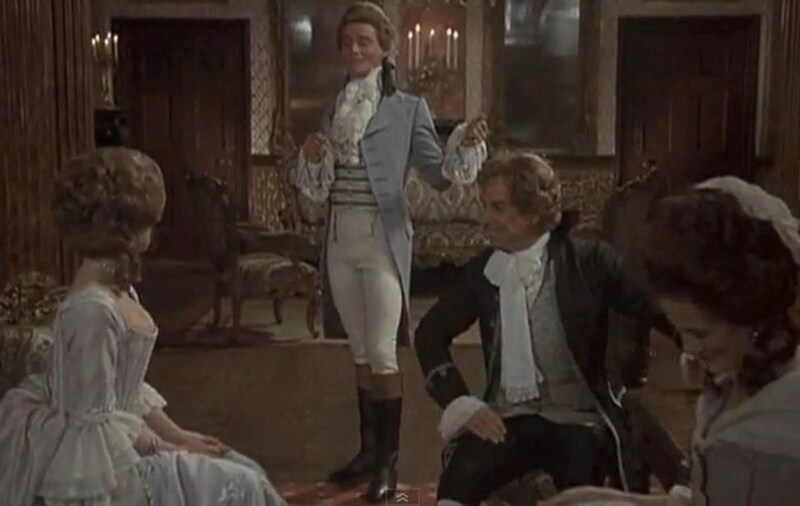 It heightens the rivalry between Sir Percy and Chauvelin. It gives Chauvelin ample reasons for wanting to do what he does. 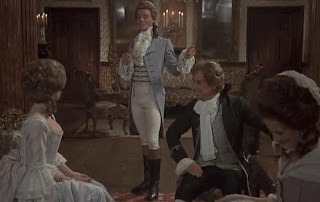 This guy is an enemy of his country, teases him unmercifully, stands in the way of his seat on the committee of something-something-or-other and waltzes off with Marguerite. Almost makes you feel sorry for him. Don't worry, I did say almost. Not quite. Now, I guess I come to what I don't like. In one word, Armand. Wait, I do like him *pretends to not notice the shocked silence of everyone reading this* but with the authority of this movie you could be justified in hating him. But then, it would have taken a lot of screen time to properly devolop Armand and more Armand would mean less Percy. And that would be a tragedy. One little warning: there are two scenes that strongly suggest that Armand and his fiancee are living together without being married. Unfortunate (why does there have to be an inappropriate scene put into every movie with more than its share of amazingness? ), but then, what's a fast-forward button for? Other than that, there's an unfortunate bit of language. Squeamish me was quite pleased with the lack of violence in this movie. You see enough to know what the League is saving people from, but not enough for it to be really gruesome. in this scene and so is his hat and his coat. One of the absolutely most amazing dresses. The costume design is amazing. Aside from being visually gorgeous, the costumes suit each character perfectly. And they have cravats! And boots! And gorgeously lacy cuffs! I think late eighteenth centry fashion is my favorite. Period. Just imagine going around in one of Marguerite's dresses. Wait, no. Not the pink one. I do not like the pink one. And if you could just make the neckline a little higher? Thank you. Now I'm gorgeously, shamelessly happy. The soundtrack is also quite lovely. I can't describe it, but you'll hear it when you watch it soon. You are going to watch it soon, aren't you? *inserts stern glare. * The cinemeatography isn't is good as it could be, but considering that it was shot in the 80s, it's better than some more modern films I've seen. "With this ring I thee wed. With my body I thee worship. With all my worldly goods I thee endow." The wedding scene is one of my very favorite scenes. Hearing Percy and Marguerite say their vows is so. beautiful. Anybody who wants to make a really romantic movie should have a wedding scene like this one. Forget the kiss on the moonlit balcony. This is amazing. "I shall be back, my dear M. Chauvelin. I shall return - to haunt you." whomever he may be. Surely he must be an angel in disguise! I will love her till the day I die. That is the tragedy. The man I fell in love with still exists somewhere. I shall never stop loving him. I take it you approve of this movie? Approval, sir, in my opinion, demands the attainment of (very nearly) perfection. Do I approve of it? Oh yes! 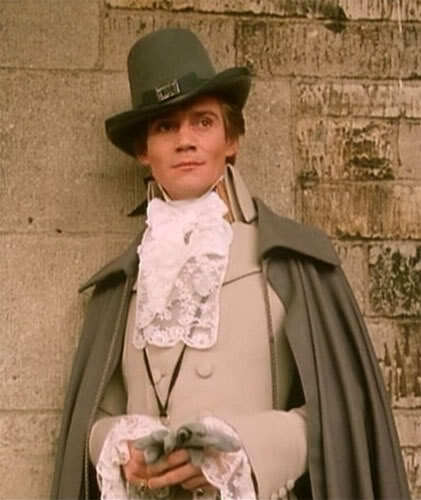 I've lamented many times the complete lack of TSP 1982 related stuff...I've searched far and wide alllll over the Internet and have only found the teeniest one-paragraph snippet of an interview with Anthony Andrews (which I will post asap)...honestly, it's one of his most famous roles, you'd think that someone would have the brains to ask him a gazillion questions for we starrrrrving fans...but no. And not only that, but there's only the smidgetiest smidgen of an interview with Ian McKellan on the Internet, and nothing from Jane Seymour! The nerve, people!!! So when I accidentally stumbled across this jewel on YouTube (and whoever posted it...I will be your best friend forever and ever and ever...), I think I might have screamed. There is no evidence, but it is rumored that I did. I know I instantly emailed it to several people. And watched it a gazillion times that hour. Yeah, I'm that bad. 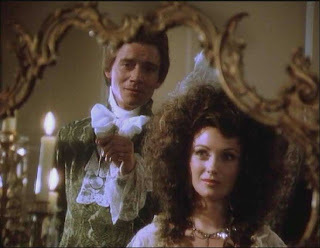 The fraction of a second we see Anthony Andrews and Jane Seymour together on set is heavenly for this deranged fan...like a friend of mine said, it's the closest thing we see to Percy and Marguerite happily married, since in the movie after they're married they either are barely speaking to each other or are beating off bad guys, so you don't get very many nice old married couple kind of scenes. Sigh. I hope you enjoy it as much as I do...and I think we should investigate a campaign to get a new edition of the DVD coming...with looooooooots of interviews!!! What say ye?